Bring Tokyo at night to your home, wherever you are in the world. The Homestar Lite Home Planetarium projects the nocturnal spectacle of Japan's capital city, capturing the night sky in full wintry glory in mid-December. The vista features the Big Dipper, Orion and the Milky Way. As with all the Homestar models, this is a stylish yet practical modern household accessory, so it's fully adjustable to the projection angle you want (ideal for almost any wall or ceiling), making for a very practical mini model in the bestselling Sega Toys range of home planetariums, produced by famed planetarium designer Takayuki Ohira. 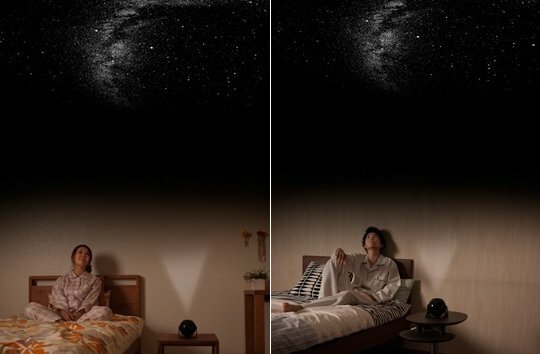 This model is just perfect for people who want a beautiful but minimal astronomical experience. Minus the fuss of losts of options and discs, everything you need is here: 10,000 stars projected in a quality optical planetarium, plus the Home Planetarium comes in a choice of two colors, white or black.